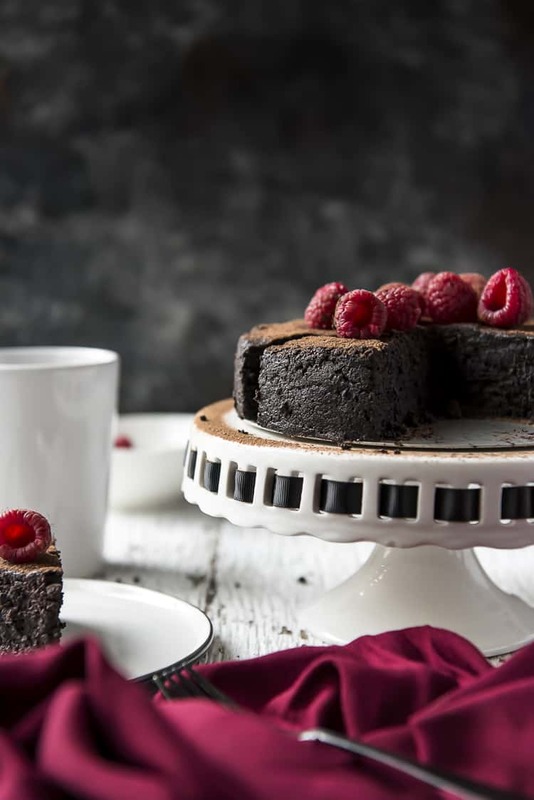 This incredible Flourless Espresso Chocolate Cake is a total dream for chocolate and coffee lovers – and you can make it in your Instant Pot! Dense, fudgy, and decadent, this truffle-like dessert is made with only 5 ingredients and is completely gluten-free and low-carb/keto. We are super excited to be working with Eggland’s Best in 2019 to create a dozen delicious sponsored recipe posts to keep you drooling! Raise your hand if you’re a chocoholic. Now raise the other one if you can’t live without coffee. In my mind, I see an endless sea of fingers, so let’s just get right to today’s recipe. JUST TAKE ME TO THE FLOURLESS ESPRESSO CHOCOLATE CAKE ALREADY! 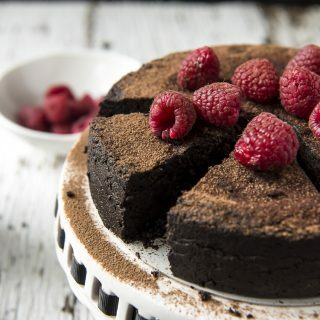 If you’d rather skip my (pretty darn helpful) tips and tricks, essential cooking info, and similar recipe ideas – and get straight to this deliciously easy flourless chocolate cake recipe, just scroll right on down to the bottom of the page where you can find the printable recipe card! First thing’s first – yes, this cake is perfect for Valentine’s Day. You’ll note the red and the raspberries and the overall “sweets for my sweet” vibe I went for here. But honestly, this is a cake I would personally eat any day of the year. Fellow chocolate lovers, this is not a cake you want to skip making. This baby, right out of my cookbook (and adapted with oven directions), is unlike any other cake you’ll ever try. Dense and fudgy, it’s almost like eating a very dark chocolate truffle. It’s also incredibly rich, so a thin slice will easily satisfy your sweet tooth. Plus, you’ll keep your dessert guilt at an all-time low. As with any of my dessert recipes, you can (and should) customize it to your tastes. Feel free to use any combination of dark chocolate you’d like – I stuck with 60% and 75% and it was perfect for me. 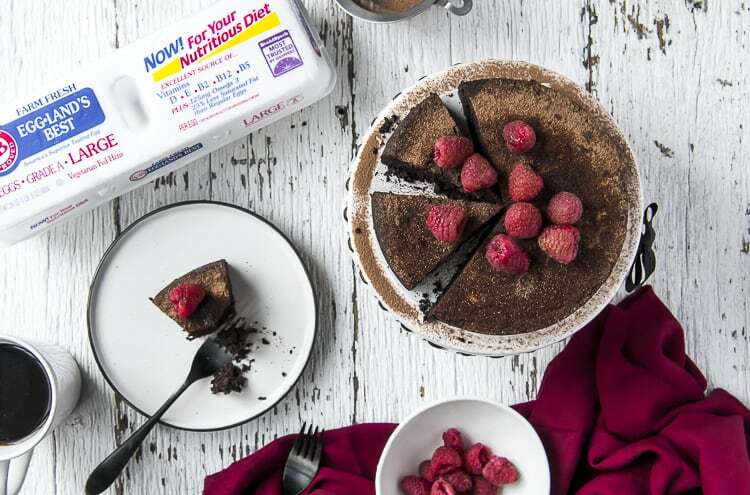 In addition to the chocolate, this flourless cake only need 4 more ingredients! Butter, and plenty of it. Espresso powder, for that deep chocolate and coffee kick. 6 Eggland’s Best Eggs. Their farm-fresh eggs give this delicious cake its body – plus loads of vitamins (10x more vitamin E! 6x more vitamin D!) and more than double the omega-3s of an ordinary egg. The combination of all these ingredients make for a very chocolatey experience. If you need a little extra sweetness in yours, you can a bit of sugar without affecting the perfect cake outcome at all! Yes! 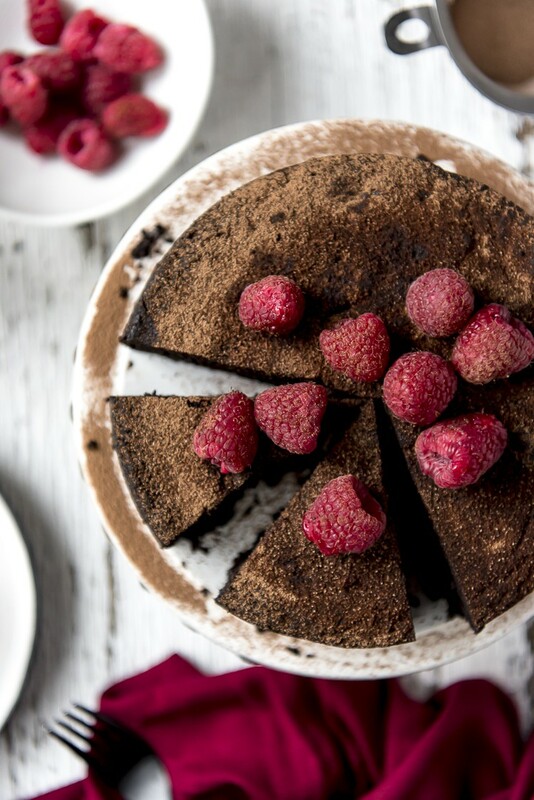 This flourless chocolate espresso cake is naturally gluten-free! There is no addition of any flour, meaning you can enjoy it with no adverse reactions. Yes – it can be with a couple of very simple substitutions! ). This cake is mostly chocolate, so the darker you go, the fewer net carbs you’ll be eating. , all chocolate contains some sugar, so keep that in mind. is a concentrated form of coffee crystals. It does contain caffeine, so keep that in mind when baking if anyone eating sweets containing espresso powder has a sensitivity to it. It is often used in baking vs. drinking to enhance the flavor of chocolate, but increasing the amount used really begins to bring out the coffee flavors. Espresso powder isn’t usually found at grocery stores, but specialty kitchen stores (such as Sur la Table) carry it, as well as Amazon. In a pinch, you can use instant espresso or instant coffee in this recipe! Simply add about 50% more (an extra tablespoon) for that (slightly less rich) coffee punch you’re craving. You can also cut back on the powder if you prefer to keep the chocolate flavor pure. No – in fact, it tastes infinitely better at room temperature. The cold air from your fridge (even if the cake is wrapped) will begin to dry out the insides (this is the case with any cake). Leaving the cake, covered, on your kitchen counter will give it a max of a 2-day shelf life, so eat quickly! If you’d rather extend the life a little, you CAN refrigerate it (again, covered) for up to 4 days. When you’re ready to eat it, pull it out of the fridge at least 2 hours prior to allow it to come to room temperature. This cake does freeze very well! Wrap it up tightly in plastic wrap and place it in a large zipper bag. Thaw it overnight in the refrigerator when you’re ready to serve it, and sprinkle a fresh dusting of cocoa on top. First, line a 7-inch round cake pan with parchment, then spray with non-stick cooking spray. Set it aside. Next, either preheat your oven to 300 degrees F (if baking) or add 1/2 cup water and a trivet to the inner pot of your Instant Pot. Melt the butter & chocolate chips over a double boiler (or in 30-second bursts in the microwave), stirring it until it’s smooth and shiny. While the chocolate is still hot, stir in the espresso powder, sugar (if using), and salt until it’s dissolved. Set it aside to cool slightly. Next, place whole eggs in a clean bowl, or in the bowl of a stand mixer. Whip them on medium-high speed for 4-5 minutes, or until the eggs are pale and tripled in volume. Then, fold the whipped eggs into the chocolate mixture in 3 batches. Make sure to fold slowly and thoroughly between each addition. Double wrap the bottom of the pan in foil and set it in a larger cake pan. Place the pans in the oven and fill the larger pan with hot water until it reaches halfway up the cake pan. Bake the cake for 25-35 minutes, or until the cake has risen slightly and the edges are beginning to set (the center will still look wet). Remove the cake from the water bath and allow it to cool completely on a wire rack before removing it from the pan and serving. 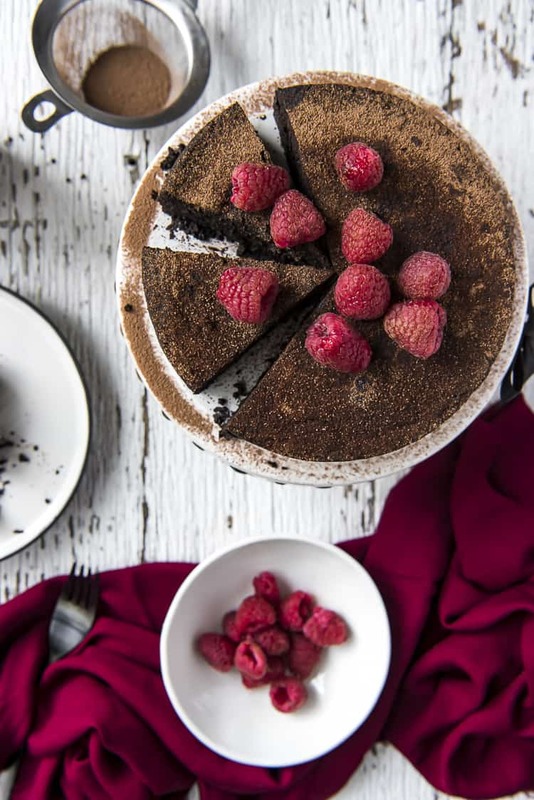 Dust the cooled cake with sweetened cocoa powder and garnish with fresh raspberries. Cover the pan with a piece of aluminum foil, pressing the foil on the surface of the batter to keep it from sweating. Set the cake pan on a foil sling. Gently lower the cake onto the trivet, secure and seal the lid, and cook on Manual High for 35 minutes. Allow a full Natural Release (about 8-10 minutes) before removing the cake. Cool the cake completely on a wire rack before removing it from the pan and serving. Dust cooled cake with sweetened cocoa powder and garnish with fresh raspberries. LOOKING FOR MORE CHOCOLATE CAKE RECIPES? 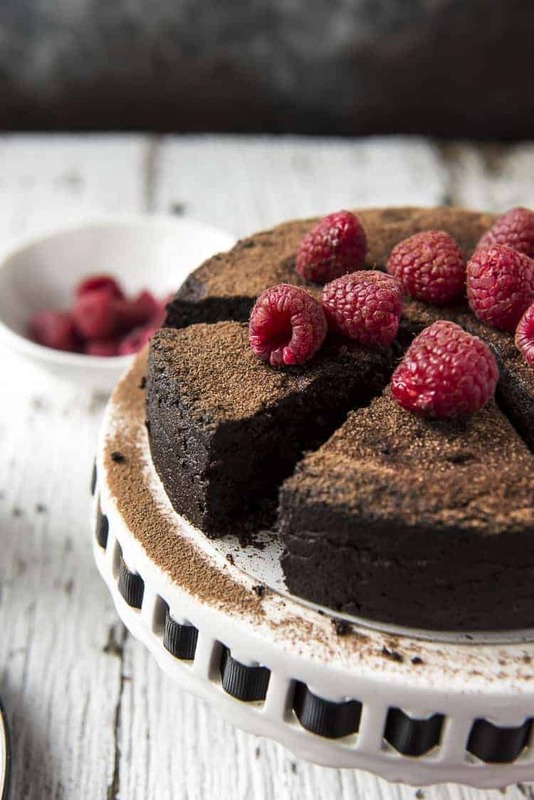 WATCH HOW TO MAKE THIS FLOURLESS CHOCOLATE ESPRESSO CAKE! 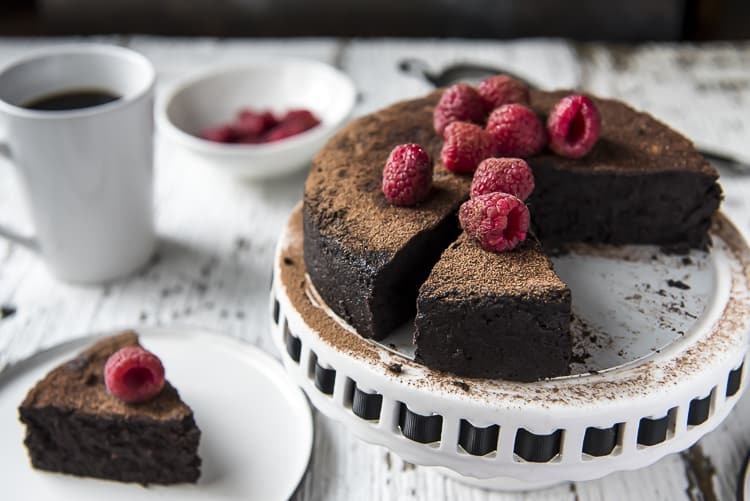 This incredible Flourless Espresso Chocolate Cake is a total dream for chocolate and coffee lovers - and you can make it in your Instant Pot! 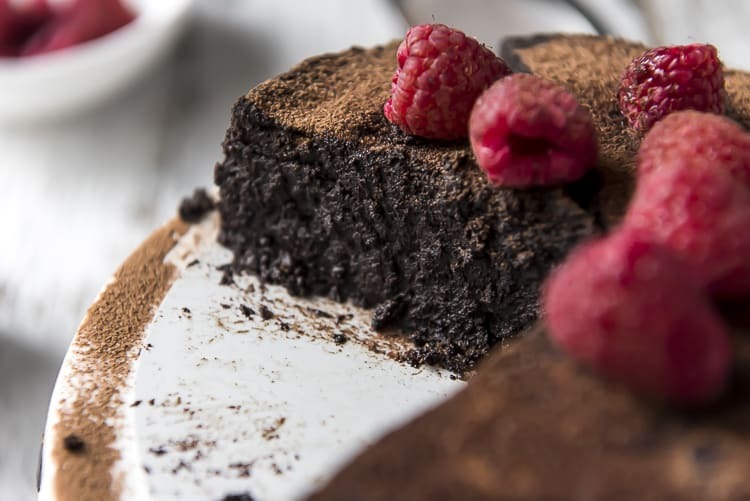 Dense, fudgy, and decadent, this truffle-like dessert is made with only 5 ingredients and is completely gluten-free and low-carb/keto. Line a 7-inch round cake pan with parchment, then spray with non-stick cooking spray; set aside. Melt the butter & chocolate chips over a double boiler or in 30-second bursts in the microwave, stirring until smooth. While the chocolate is still hot, stir in the espresso powder, sugar (if using), and salt until dissolved. Set aside to cool slightly. In a separate bowl, or in the bowl of a stand mixer, place whole eggs. Whip on a medium-high speed for 4-5 minutes, or until the eggs are pale and tripled in volume. Fold the whipped eggs into the chocolate mixture in 3 batches, being sure to fold slowly and thoroughly between each addition. Cover it with a piece of aluminum foil, pressing the foil on the top of the batter to keep it from sweating. Set the cake pan on a foil sling. Pour ½ cup of water in your Instant Pot or electric pressure cooker, then set a trivet or egg rack inside. Gently lower the cake onto the trivet, secure and seal the lid, and cook on Manual High for 35 minutes. Allow a full Natural Release (about 8-10 minutes) before removing the cake. Allow to cool completely on a wire rack before removing it from the pan and serving. Set the cake pan into a larger (9-10-inch) cake pan. Fill the larger pan with boiling water until it reaches halfway up the sides of the cake pan. Bake for 25-35 minutes, or until the cake has risen slightly and the edges are beginning to set (the center will still look wet). Either leave out the sugar completely or replace it with a sugar substitute like erythritol (Swerve) or Stevia drops. Be sure to use Stevia-sweetend dark chocolate, like Lily's. 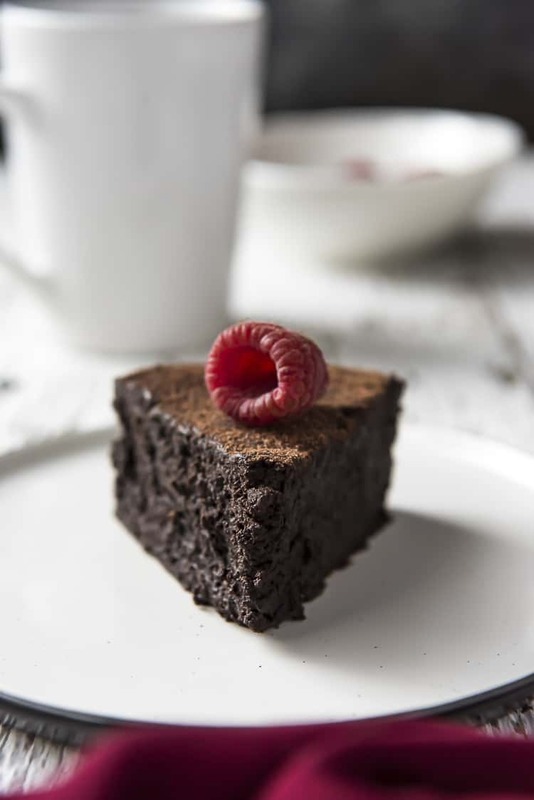 PIN THIS FLOURLESS CHOCOLATE CAKE FOR LATER! Brought it to a friends house for a dinner party last night. There were 5 of us. Everybody went crazy for this dessert. I will definitely be making this again. I am so happy to hear that you all loved it, Joan! Thank you so much!